View - 910 N Oakland Av. 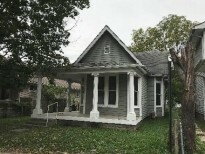 Recently rehabbed home on east side of Indianapolis. Home features an updated kitchen with a formal dining room. Bonus room could be used as a third bedroom.